Rinse the raspberries in a colander to remove any dirt or leaves from the raspberries. Gently mash the raspberries with a potato masher. You don't want the raspberries totally mashed to a pulp, but you should still have a few chunks of raspberries left. Measure the crushed raspberries. You should now have 5 cups of crushed raspberries. If you have too much or not enough, adjust the quantity so that you have exactly 5 cups of crushed berries. 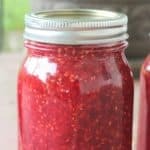 This recipe makes 4 pints or 8 half pints, so sterilize your canning jars and rings and lids by running them through the rinse cycle in your dishwasher. Leave them in the dishwasher until you are ready to use them. Place crushed berries and the box of powdered pectin in a large stock pot. Stir. Bring to a boil that cannot be stirred down. Add the sugar and stir. Bring the mixture back to a boil that cannot be stirred down. Set the timer for 1 minute. When the timer goes off remove the stock pot from the heat and skim any foam off the jam with a metal spoon. Ladle the raspberry mixture into the jars, leaving 1/4 inch head space. You can easily measure the head space with this inexpensive canning funnel. Wipe the rims of the jars with a damp paper towel or kitchen towel and place the lids and rings on the jars finger tight. Place the jars in a boiling water canner that has been filled half way with water. Make sure that there is at least 1 inch of water covering the jars in the canner. Add additional water if necessary. Bring the water to a rolling boil and process the jars for 10 minutes. Remove the jars from the boiling water canner and place them on a towel on the kitchen counter to cool.